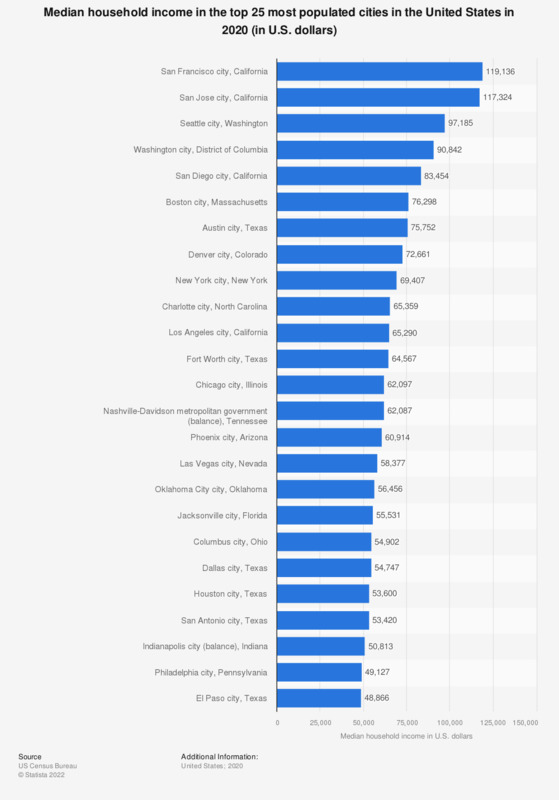 This statistic shows the median household income of the top 25 most populated US cities in 2017. In New York, median household income was 60,879 U.S. dollars. The median household income of the United States can be accessed here. According to data released by the U.S. Census Bureau in 2017, San Jose city in California had the highest median household income of cities ranking within the top twenty in terms of population. However, the median household income in San Jose was 104,675 USD in 2017. In 2017, San Francisco in California was ranked first, and Washington D.C. was ranked fourth in Median household income list. Median household income in the United States fell in recent years. In 2007, before the worst of the recession, median household income was 56,436 U.S. dollars nationwide. As of 2013, median household income had dropped by roughly 3,800 U.S. dollars to 52,850 U.S. dollars. As of 2014, median household income by state was highest in Maryland, New Hampshire, and New Jersey. It was lowest in Alabama, West Virginia and Mississippi. Families with an annual income of less than 25,000 U.S. dollars made up the largest income bracket in America, with about 30 million households. Data on median household income can be compared to statistics on personal income in the U.S. released by the Bureau of Economic Analysis. Personal income rose to 15.46 trillion U.S. dollars in 2016, the highest value in over ten years. Personal income is a measure of the total income received by persons from all sources, while median household income is “the amount with divides the income distribution into two equal groups,” according to the U.S. Census Bureau. Half of the population in question lives above median income and half lives below. Though total personal income has increased in recent years, this wealth is not distributed throughout the population. In practical terms, income of most households has decreased. One additional statistic illustrates this disparity: for the lowest quintile of workers, mean household income has remained more or less steady for the past decade at about 11 or 12 thousand constant U.S. dollars annually. Meanwhile, income for the top five percent of workers has actually risen from about 244,138 U.S. dollars in 1990 to about 350,870 U.S. dollars in 2015. In probability theory and statistics, a median is described as the numerical value separating the higher half of a sample, a population, or a probability distribution, from the lower half. Everything On "Poverty and Income in the United States" in One Document: Edited and Divided into Handy Chapters. Including Detailed References. Statistics on "Poverty and Income in the United States"